On Friday Jaeger and Calvin left for New York City to visit Jaeger’s sister as well as doing some site-seeing. Originally, I was planning to go with them. However, 3 plane tickets are more expensive than 2 and I didn’t think all of us would fit in Bethany’s apartment, at least not comfortably. So, I told Jaeger that if he didn’t mind, I’d prefer staying home. To my surprise, he agreed. As a result, the last couple of days have been the first time, since Calvin has been born, that I’ve been by myself and didn’t really have anything scheduled that I needed to do. It’s been very, very relaxing. I spent a fair amount of time pottering around in the yard. As I’ve probably mentioned before, our yard was loved by someone at one point but it’s gotten completely out of hand. The cat mint, which was planted on purpose, is particularly problematic. I’ve lost count of the number of hours I’ve spent yanking every shoot I can find out. I’ve been trying to get as much of the root structure as possible but it’s wily, and there’s a lot of it. I was also planning to start digging a 4′ x 6′ x 2′ hole for a sandbox I want to get for Calvin. When Jaeger was growing he had a sandbox that was about 3′ high but 2′ of it was sunk into the ground. I was planning to do something similar for Calvin’s sandbox. However, only a couple inches down from where I was hoping to put the sandbox I struck large tree roots. Given how many trees we have on our property, I probably shouldn’t have been surprised. The spot I chose is still the best spot for a sandbox. There’s nothing worthwhile there at the moment and it’s nicely shaded for hot summer afternoons. So, I’m not sure what we’re going to do. I need to talk to Jaeger about it. I suppose we could still do a 3′ high sandbox there, we’d just have to provide a ladder or something. 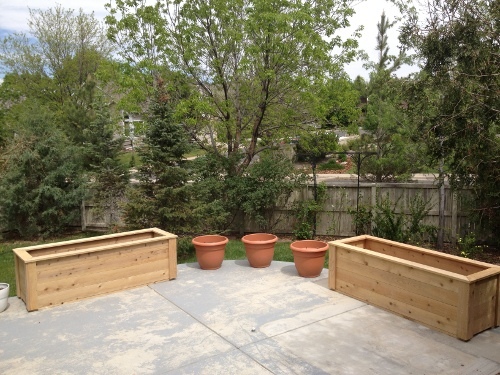 The project I did successfully complete is assemble our planters. Our house has a small deck at that back that goes down to a large concrete pad. The pad use to have a hot tub on it but neither Jaeger nor I wanted to deal with a hot tub so the prior owners took it with them. However, that leaves us with an awkwardly big piece of concrete. It’s not particularly good for outside dining or playing because it gets full, very hot sun1. To add insult to injury, it’s the only place that gets full sun that good enough for tomatoes and herbs. So, we bought a couple planter kids from Naturalyards. They aren’t cheap but they were relatively easy to put together and I think they look nice. I haven’t figured out what we’re going to do with the rest of the space yet. I went shopping on Sunday and spent way too much money of books and also bought some clothes. The rest of the time I’ve gone for walks, read, or watched DVDs. Jaeger and Calvin should arrive back from their visit tonight. It’s been very pleasant being by myself but I’m ready for Jaeger and Calvin to come back now. This entry was posted in Books, Home and Garden, Updates on May 29, 2013 by kiesa.